Learn how I switched my office lighting to 100% "off-grid" solar PV, batteries definitely included! Even if you don't save money, do you help to save the planet with solar PV at home? Domestic solar PV (electricity) generation is very unlikely to save money in the UK as of 2007, given UK sunlight levels, mains electricity prices and the expense of the equipment; a financial payoff time of at least fifty (50) years, ie longer than the equipment life, is a reasonable guess given 2007 prices. For some applications where mains electricity is not cheap and reliable, especially in sunnier parts of the UK, there may be good reasons to gain the autonomy of a domestic solar PV system. 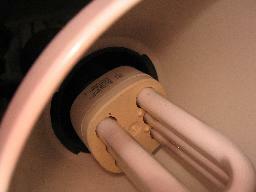 In general, probably the best thing to do so save energy is unglamorously just to use less, such as by: completely turning off unused equipment (not using standby) where possible, only boiling as much water in a kettle as you need, switching to low-energy lighting such as CFL (compact fluorescent), and using 30°C/40°C clothes washes, etc, etc. But if you still want to try to capture some sunlight? You might not want to go completely 'off-grid', but you might like generate some power locally and have 'emergency' power during a power-cut for example. One way to maximise potential efficiency and savings is to use solar-charged-battery 12V DC for specific devices, avoiding the inefficiency of an 'inverter' stepping from solar power up to 240V AC and then a transformer or other power supply stepping back down to what the equipment actually needs. Lighting, for example, does not need much power, especially if efficient LED or CFL lamps are used, and efficient 12V DC lighting can be bought in the high-street right now. I have created a simple pilot project, starting in June 2007, to see if I can make any practical use of solar power generation at home in the UK in London, without busting the bank. The primary aim is not to save money (and I won't), but rather to have a practical and useful mains-independent power system. Having toyed ineffectually with gadgets such as solar NiCd battery rechargers (I'm not convinced that I've ever had a fully charged battery in many years), I've chosen to spend on a somewhat larger scale to get more 'bang per buck'. I'm a bit of an 'owl' and often work at home late into the evening and sometimes the 'wee small hours'. My preferred working light is a mains AC anglepoise lamp, currently containing a 20W 1200 lumen CFL bulb. The aim of this project is to replace that light source with one solar-powered. ie my equipment would have to cost no more than about £50 to save money. The equipment cost is roughly five times that as we'll see. However, the equipment may last longer than assumed above, 12V DC lighting may be more efficient and/or cheaper than assumed (after all, there's a large caravaning and sailing community that uses 12V equipment and that has to be careful with efficiency and cost), and domestic mains electricity prices might rise in future (there were several nasty rises recently in domestic power costs). A bigger project would almost certainly be more efficient still. On the other hand, solar power may not provide as much power/light as I'd like during the winter months; I shall just have to see. But I'm not in this to pinch pennies, rather to see how practical PV can be! The solar cells/panel (20W, plus 62W added later). 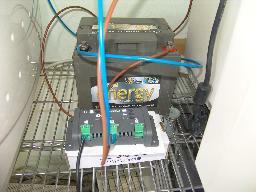 The battery (12V sealed lead-acid 40Ah gel). A charge controller to protect the battery and equipment. All of the initial equipment other than the light was bought from BrightLightSolar as their "20W DIY Solar Electric Kit" with the 40Ah Sealed Gel Battery option, including the Suntech STP020S-12/Cc 20Wp panel, costing just less than £220 including VAT and delivery. The 12V light I am using is the Hi-Gear "Twin Light" bought from Argos (catalogue number 019-1658) for ~£15 including VAT, and was selected because it is rated at 16W (ie similar to my mains CFL, assuming equivalent light out for similar energy in) with the ability to use only one of the two 8W tubes when less light is required, which should help eke out stored power for longer. I bought 10m of 2-core 3A-rated power cable from Maplin to run from the solar panel in the garden to my first-floor study (where the rest of the equipment is too) for ~£5; too low a rating would waste power as heat in the cable and might be dangerous, but at ~17V and 20W peak the maximum current that the solar panel will generate is a little over 1A. I also bought a cheap £10 multimeter from Maplin to help me monitor the state the of battery and power consumption. This brings the total to about £250. I already have simple tools such as wire-strippers, screwdrivers, etc. The BrightLightSolar 20W kit comes with the option of a larger (100Ah) battery, but given that my 16W light should use a little over 1A and thus the 40Ah battery should be able to power it for nearly 20 hours (to a safe 50% discharge level), ie about a day or two of heavy use, there does not currently seem to be any benefit in using the more expensive and higher-capacity battery. If used every day for the same amount of time [and with] the panel mounted optimally (i.e. due south at 35-40 degrees without shading), you could expect a 20 Watt light to be powered up to about 2.5--3 hours in mid-summer, and up to 1 hour in mid-winter. Two 20 Watt panels would double this performance, and so on. 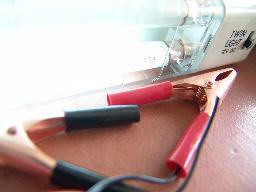 The kit is suitable for use with either the 40Ah or 100Ah battery - if you are going to use the system periodically (i.e. enabling the system to recharge itself on the unused days) a larger battery would enable you to capture more of this energy, giving you far greater performance/operation running times on the days that you use the system. This suggested to me that battery capacity was not really going to be the critical issue for me, and that I might have to buy an extra solar panel in the winter to bolster the performance of the system if it proves inadequate, ie if I can't run the lamp as long as I need to each day. Given the orientation of my house (with my study overlooking a very small west-facing garden), I'm unlikely to be able to get anything like 'optimal' power generation, but the initial setup has the solar panel hanging on a south-facing wall free of shadow from around noon until dusk. Further experimentation will be needed, I'm sure, to maximise generation when light is feeble in winter. The charge controller (the Morningstar SHS-6 which is optimised for cost and simplicity/robustness), probably just about optional in very small systems, helps protect against overcharging or overdischarging the battery, which can seriously damage it, as well as protecting against short-circuits, reverse polarity and other damaging/dangerous nasties. The panel should be orientated 35-40 degrees from the horizontal - this is a good angle for year-round optimisation. In mid winter, the panel will perform better at angles of up to 55 degrees from the horizontal, while in mid summer you will get slightly more power at the 30-35 degree level. Due to our northerly latitude there is a significant difference in the amount of light (and therefore performance of a solar system) between mid winter & mid summer - the UK gets 80% of its solar resource from March to September. From my observation of the Stellarium application set up for my home location, peak (noon) sun angle above the horizon is more than 60° in June, and as little as 15° in December, so if I wish to to maximise December output for most balance year-round (to be less hugely over-specified in summer relative to winter) then I should possibly mount some or all panels at as much as 75° to the horizontal, and even a near-vertical mount might not be disastrous. I do have obstructions (trees) to December direct sun at that low angle, but conveniently they will have shed their leaves by then, letting more light through. It turns out that there are sensible minimum and maximum battery capacities for a given system (assuming lead-acid throughout here). The minimum capacity is determined by the need not to discharge the batteries below about 50% to avoid shortening their life, so if there is the need to last through a very cloudy few days, for example, a minimum Ah to average A current drawn of 200:1 is suggested (48:1 is 24 hours' use discharging a full battery to about 50% capacity, so 200:1 is about 4 days' use). That is, minimum capacity is determined by the load. Side note: switching to Lead-free solder has required buying a more powerful (50W) temperature-controlled iron else even getting the solder to melt other than on the smallest of joins can be a pain. I'm also trying more expensive AgSnCu (ie silver-containing) solder rather than just SnCu (tin/copper). I may have to shift my working time earlier to make better use of natural light and reduce my dependency on the solar light, though of course I still have my mains light if I need it. And the light only represents a small part of my energy consumption while at my desk: my laptop probably uses 30W to 50W+, never mind Web servers and connectivity, etc, but I can't solve all of those issues at once. In mid-July I added a 62W amorphous UniSolar ES62 panel in parallel with the 20W panel using Schottky blocking diodes. This should give me far more hours of lighting in the winter, and some excess for further extensions/experiments. See how I extended the project to charge my mobile phone and power my home Internet server. I got through the winter without mains electricity for lighting, and I managed to take my Internet server off-grid with the excess energy for a significant chunk of time as a bonus. This convinced me to take a step up and make my office "zero-carbon" with a small grid-tied solar PV system. Note that the datePublished of this item has had to be inferred as it predates the main source repository. Active Robots: source of small PV cells/panels for experimentation. A small solar anglepoise in Shropshire from 'GotWind' (12V, 5W solar panel, 12Ah battery, 11W CFL bulb). See REPowered and REEnergy about small off-grid solar PV systems at home in the UK. A working 12V DC system in Suffolk. A working solar PV/thermal system in Gloucestershire, UK. A low-impact home in Wales that uses solar PV. Read about solar power water heating in Kent. Read about Renewable Energy Access including solar. Solarbuzz world solar energy news. 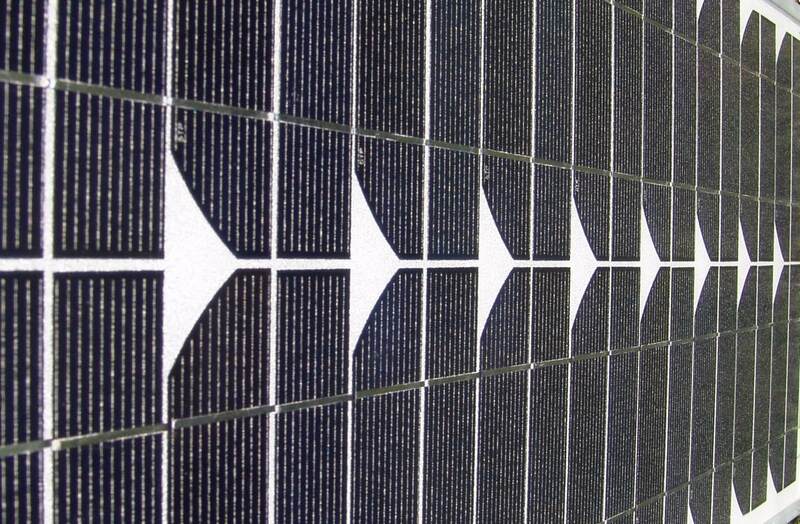 The Energy Blog on solar PV. The ForceField DIY alternative power generation board. A range of 12V CFLs from EDC. Andy Rankin of Midsummer Energy has been very helpful, and has pointed out that the UniSolar US64 is good in low light and about 20% cheaper per Watt than the typical monocrystaline panel as of mid-2007. Their solar panel calculator suggests that each Wp of panel will generate about 1Wh per day in winter in the UK and about 5Wh/day in the summer (and a yearly average of ~2.47Wh/day), so to cover nWh of base load year-round might require nWp of panel, plus maybe 20% for storage and conversion losses, and with a huge excess of capacity in summer. The Build It Solar site. See solarworld24 for solar power equipment. RS and Maplin Electronics for various electrical/electronic components such as wires, lights and solar panels. FirstPhoneShop 12V (car) mobile phone chargers. First published 2007-06-20 , updated 2019-04-22 , rebuilt 2019-04-23 . Site copyright © 2007-2019 Damon Hart-Davis. Hosted by ExNet.